As dawn breaks over the Pont Neuf, and the cobbled alleyways of Paris come to life, Anna Trent is already awake and at work; mixing and stirring the finest, smoothest, richest chocolate; made entirely by hand, it is sold to the grandes dames of Paris. It's a huge shift from the chocolate factory she worked in at home in the north of England. But when an accident changed everything, Anna was thrown back in touch with her French teacher, Claire, who offered her the chance of a lifetime - to work in Paris with her former sweetheart, Thierry, a master chocolatier. With old wounds about to be uncovered and healed, Anna is set to discover more about real chocolate - and herself - than she ever dreamed. I felt like I was in book heaven when Jenny Colgan’s new book arrived in the post this week. 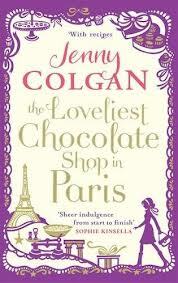 What more could a woman ask for in a book than the words Chocolate and Paris! I had insanely high hopes for this book I wanted to devour it as quick as a bar of chocolate rather than sit and savour it! The story alternates between the past with Claire’s stay in Paris to the present with Anna’s adventures in Paris. Anna has been working in a chocolate factory so when she has an accident that leaves her a little lost in direction until her old French School Teacher Claire arranges for her to have a taster at working with a chocolatier friend of hers in Paris. The amount of research that must have gone into this book shines through from the picturesque setting of Paris to the mouth-wateringly detailed description of chocolate making and tasting I only wish the author would have found it in her heart to have invited me along for the research! There is more than just a beautiful setting in Paris and heavenly chocolate to this story there is also romance which I am sure you would expect from a book set in the romantic Paris. There was a particularly emotional part in this book as well which was very touching. One of my favourite books is Meet me at the Cupcake Café which is also by this author and I am sure a lot of you who are reading this review would have read it, that book has a very warm cosy feel to the book whereas this book feels a little more chic and traditional. I did find the choice of injury to Anna a little bizarre but I did love her character she seemed to have come to a point in her life where she needed a little push in the right direction so she could make the most of her life which I think most of us can sympathise with. One thing that seemed to be a great hit in this authors books are the recipes she gives us and I am pleased to tell you that they feature in this book too. I am very tempted to make the Malteser Cake! This is a fantastically written book that will get those taste buds dancing, I thoroughly enjoyed this book now I can’t wait for Christmas at Rose Hopkins’ Sweet Shop.